When Julius Caesar conquered Gaul he also had to subdue the seaborne tribe of the Veneti. The Romans bragged that they got them all, killing or enslaving them. This seems to be a very convenient piece of self-serving propaganda, and I for one do not believe it. A tribe which specialised in ocean travel and the use of boats would be difficult, if not impossible, to bottle up. A good many of them would have been able to slip away in the face of an attempted capture by the Romans. A few centuries later the geographer Ptolemy notes that the Venicones lived in north-eastern Britain (in the region of Fife and on both banks of the Tay to the north), and a tribe called the Venicnii in north Ireland (Donnegal). To my eye this is quite obviously the same name, Venic + '-on' or '-n'. Incidentally, the use of '-ion' is still used as a plural by the Welsh, and the Venet tribe would probably have used something similar, making the name Venet-on. The reconstructed suffix '-on' is a plural and is also in genitive case (see the Checklist of Proto-Celtic Lexical Items). The genitive case is icing on the cake because genitive means here 'having its origin in'. So the suffix '-on' with a tribal name indicates 'the ones (plural) having their origin in [placename]'. The name Venicones was pronounced 'Wen-ichones', most likely due to a shift in the language. In the case of this tribe, it is Venet (the 't' becoming a 'ch') + '-on' (plural genitive) + the later addition of '-es', which is another (and I think unnecessary) plural suffix. The Romans would probably have mispronounced it and they apparently added their plural suffix to the already-present plural genitive, giving us Venicones. The Venicones were occupying the same region that the Romans needed to invade several times in order to quell attacks by Picts in the east of the Highlands, including from the 'Pictish navy'. 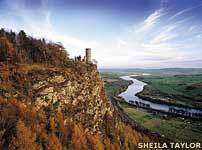 A legionary fortress was built at Inchtuthill, Tayside (Pinnata Castra), occupied during the late first century by the 20th Legion Valeria. One has to suspect that the Pictish navy was manned by people who traditionally hated Romans, as they went out of their way to attack Roman Britain. All of this seems to point towards a tribe of experienced seaborne warriors with the same name (given natural shifts in pronunciation) as another, previous, seaborne tribe in Armorica. One could easily postulate that the survivors of the Roman conquest of the Veneti in Gaul climbed into their boats and settled in Fife and Donnegal. And the rebuilt tribe that occupied Fife continued the fight. Once beaten in Fife by the renewed Roman attack on them, some of them apparently joined the Roman side, and were later rewarded with the Deceangli/Gangani territory in what is now north-west Wales, which the new owners promptly named after their tribe. Any of them which did not join the Romans and were not thereby enslaved, probably were absorbed into the nearby unconquered Venicones area which later went by the name of Verturiones (Fortriu), with whom they shared a common origin (see the map below). Venet was probably pronounced 'Wened' by that time (AD 100-300), and soon enough, due to the addition of a 'g', settled into its modern spelling of Gwynedd. circa 58-52 BC - Julius Caesar leads Roman legions into Gaul. circa 56 BC - Caesar's fleet defeats the Veneti off the coast of what is now Brittany. circa AD 80 - Agricola marches legions north through Fife to the Firth of Tay. The inhabitants between Forth and Tay are the Venicones. 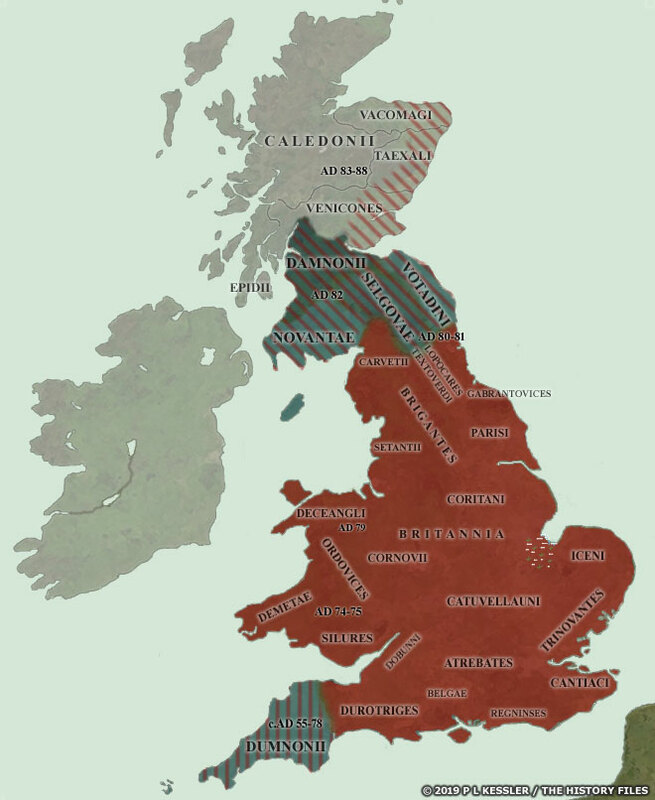 circa 390 - At the request of local Roman government, possibly by Coel Hen (Old King Cole - see the Kings of Northern Britain), a branch of Romanised Venicones (Veneti) move from Manau in the northern Gododdin (Votadini) kingdom, to the north and west coast of what is now Wales. The territory is given to them on the condition they expel the Irish (Scotti) and defend it. Paul Johnstone's Sea-Craft of Prehistory involves a useful discussion of skin boats and leather sails. An interesting sidebar is the Veneti use of leather sails on their boats. Julius Caesar remarked on the Veneti using leather sails, an odd practice from the viewpoint of anyone accustomed to Mediterranean ships. It indicates an origin for the Veneti far from civilisation and its woven sails - which sails they would have encountered if the tribe developed in situ in Armorica, as traders constantly sailed to nearby Dumnonia to purchase tin. It also indicates an origin somewhere where ships would be needed, a shore or an island. This leaves us with the islands of Britain and Ireland, the shore of Gaul east of Britain, and the region of Scandinavia and the Baltic Sea. Their ships were wood, so an origin in Ireland is doubtful. Their sails were leather, so an origin in Britain is doubtful. Scandinavia itself was inhabited by Germanic and Finnic tribes. This leaves us with the areas of the Belgae in northern Gaul, the Jutland peninsula, and the southern/eastern shores of the Baltic. Just such a boat seems to have been found at Bruges, Belgium, dated to the second or third century AD (see the Online Library). And from Bad Kreuznach, a mosaic showing such a boat is featured in figure 3 of an Archaeology Data Service report (see link on the right). There were Veneti in the Baltic along the shore in the region of the Oder and Vistula rivers. The name itself means 'white' in Common Gaulish. It is cognate to the English words 'white' and 'winter'. It might mean 'the winter people', or it might mean 'the blonds' (white hair). Or it more likely comes from an ancient leader or founder of the tribe who might have been blond and nicknamed 'White'. One can envision a possible migration of Veneti from the Baltic coast by sea to Armorica. Then a flight of survivors from Armorica to Fife in Scotland and Donnegal in Ireland. Then Romanised Veneti of Fife move into western and northern Wales and found the kingdoms of Gwynedd and Ceredigion. Text copyright © Edward Dawson. An original feature for the History Files.